Teasels are monocarpic perennials. The plant grows as a basal rosette for a minimum of one year, then sends up a tall, flowering stalk and dies after flowering. The rosette stage varies according to the amount of time needed to acquire enough resources for flowering to occur. During the rosette stage, leaves change from being somewhat ovoid in the younger stage to large, oblong, and quite hairy in the older stage. During the rosette phase, teasel develops a large taproot. The taproot may be over 2 feet in length and 1 inch in diameter at the crown. Common teasel blooms from June through October. Flowering plants have large, oblong, opposite, sessile leaves that form cups (the cups may hold water) and are prickly, especially on the lower midrib. Teasel's unique inflorescence makes the plant readily identifiable when flowers or seedheads are present. Flowers are small and packed in dense, oval-shaped heads. The flowers are subtended by stiff, spiny bracts that are located terminally on the flowering stems. Common teasel generally has purple flowers. Flowering stems may reach 6-7 feet in height. But white flowers can also be present. The common and cut-leaved teasels are European plants introduced to North America in the 1700's. Teasel is currently used in horticultural plantings and dried flower arrangements. Teasel grows in open, sunny habitats that range from wet to dry levels. Optimal conditions seem to be mesic habitats. Roadsides and heavily disturbed areas are the most common habitats of teasel. Teasel sometimes occurs in high quality prairies, savannas, seeps, and sedge meadows. Both species have become severe threats to northern Illinois natural areas. Rapid expansion of the range of cut-leaved teasel has been observed in several midwestern states, including southern and western Wisconsin. The teasel population has rapidly expanded in the last 30 years. Movement has been documented along highway systems, where dispersal is aided by mowing equipment. Teasel is an aggressive exotic that forms extensive monocultures. Teasel produces an abundance of seeds. A single teasel plant can produce over 2,000 seeds; up to 30-80% of the seeds may germinate. Seeds may remain viable for at least 2 years. Seeds typically don't disperse far; most seedlings will be located near the parent plant. However, highway mowing equipment and inappropriate disposal of dried teasel heads from flower arrangements can increase the spread. Dead adult plants leave a relatively large area of bare ground formerly occupied by their own basal leaves, providing an optimal nursery site that new plants readily occupy. Seeds may be water-dispersed, which allows dispersal over longer distances. Immature seedheads of cut-leaved teasel are capable of producing viable seed. Cutting, digging, and burning are recommended as the best solutions for control in natural areas. In small areas, rosettes can be dug up using a dandelion digger. Like dandelions, as much of the root as possible must be removed to prevent resprouting. Cutting with a sharp spade or shovel below the surface of the soil can be helpful, but the area should be checked later for resprouts. As an alternative, the stalks of flowering plants can be cut just before flowering. The plant should not reflower, but instead die at the end of the growing season. Cut flowering stalks should be removed from the natural area if the flowers have opened, because seeds can mature on the stem even after cutting. Cutting the flowering stalk before the full bud stage should be avoided because the plant will usually send up new flowering stalks. 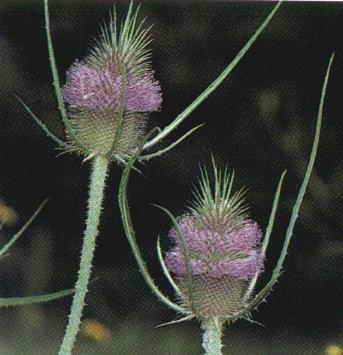 Cutting flowering stems may need to be repeated for several years to control teasel. Teasel in nearby areas should also be eliminated to prevent introduction of new seed. Late spring burns can be useful in controlling teasel before it becomes dense. Burning should be employed with other methods to insure maximum control. Manual removal is assisted by burning the site in the spring so that the basal rosettes are visible amidst the blackened soil and grasses. Triclopyr is dicot-specific and can be applied to foliage and stems at 2% active ingredient (a.i.) during the growing season, preferably before the plant has bolted (sent up a flowering stalk)--triclopyr is apparently the more effective of the two. Glyphosate is also effective when applied to foliage and stems at 12-2% a.i. before bolting, although it is non-selective. Herbicide can be applied after bolting, but seed development remains a risk. The rosettes of teasel remain green late into the fall, after most other plants have become dormant--application at this time reduces the risk of harming non-target species. Glyphosate may also be effective during the dormant season, providing the rosettes are photosynthesizing when glyphosate is applied.